C is for Cookie and that is good enough for me. This challenge we decided to make cookies since it is national cookie month and it's Erin favorite thing to make. Sara made a Earl Grey Shortbread Cookie. She used the Martha Stewart recipe from her Cookie Book. Here is a link. Sara's favorite tea is Earl Grey and her favorite cookie is Shortbread, so this was a definite winner for her. Erin's husband loves Chocolate Chip Cookies however this summer he discovered Oatmeal Apricot Cookies at a camping trip and proceeded to eat more than his share of the batch. So, he wanted Erin to make some. She found her recipe here which also happened to be Martha Stewart. It was a tight race but the winner, as chosen by our friends and family of taste testers was Chocolate. Sarah Bernhardt Cookies to be exact. We assume they are named this because of the dramatic presentation but who knows, ask Martha cause this is again her recipe. I guess we should have named this the Martha Stewart Cookie Challenge. These cookies take a lot of steps to make them. In fact we made them over the course of an afternoon and a morning, since there is lots of chilling involved. 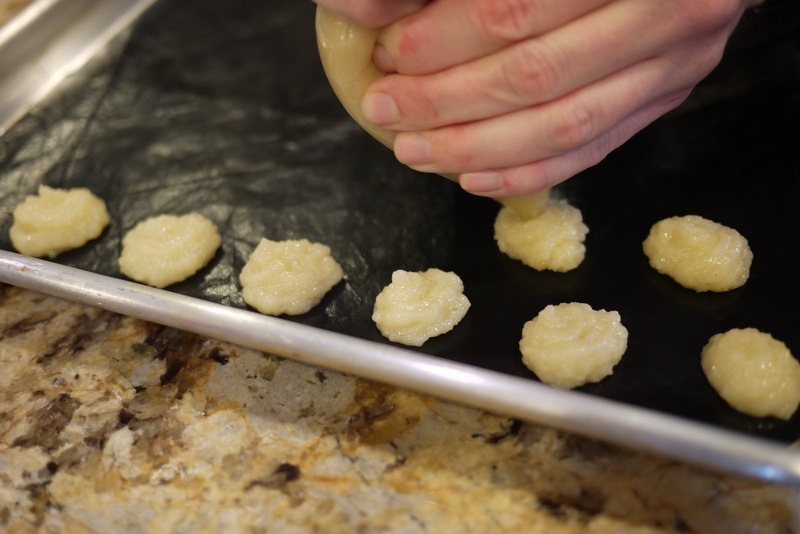 First you make the Macaroon dough and then pipe them on the pan. We used a zip lock bag since we didn't have the tip that Martha suggests. We felt that it worked great. After baking these, we had to taste them as pre protocol and Mom helped out with that. Here response was "Mmmm! That's what I'm talkin' about!" She loves almond macaroons and these cookies were destined for success. Next make the filling and let it chill to truffle like consistency. The trick here, which we didn't do, is to put the filling in the bag in small batches so that you won't warm it up too much with your hand. Once the filling has been piped, the cookies go into the freezer for chilling. After that chilling, chocolate and vegetable shorting are melted to create the shell for the cookies. Like we said, lots of steps but this makes for a very chocolaty yummy cookie. Thank you to all of our taste testers that came to sample and give their opinions. We are looking forward to our next challenge...hummm what to bake?? Lessons learned: Chocolate and shortening make a great chocolate shell. We could have used this knowledge a couple of weeks ago for our ding dongs. Chocolate always seems to win though the other 2 cookies will become staples as they were very delicious and not as hard to make.